It feels like time just zips by these days. Partly that’s because crypto moves lightning fast, but also every single day has been jam-packed at the CoinFi office. August has been no exception! At the end of July, we rolled out CoinFi News to a small number of early beta testers. Since then we’ve been gathering user feedback, conducting 1-on-1 user interviews, prioritizing feature requests, and improving the product accordingly. Although we’ve been receiving feature requests and suggestions on a daily basis, talking with our users directly is core part of the product development cycle. We had extensive 1-on-1 conversations with 22 users in August. Some of these interviews were for usability testing, but we also just wanted to talk to CoinFi users and get a better understanding of how you trade crypto these days. 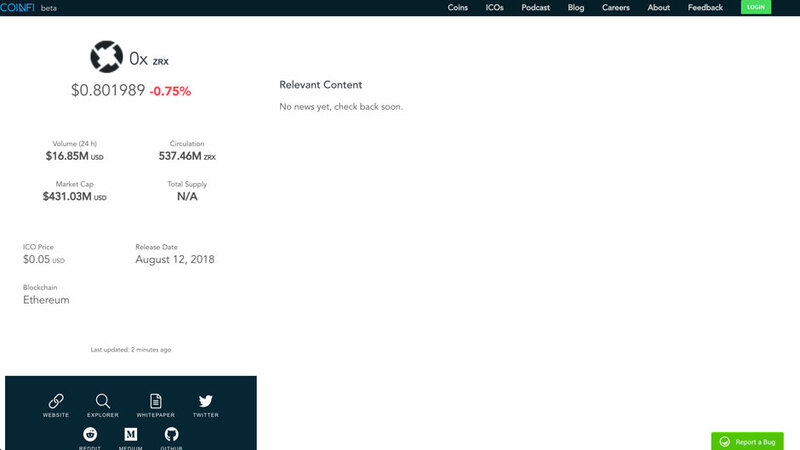 The highlights of using CoinFi News for the participants were 1) having a single destination where you can get the news that matters 2) an intuitive layout for browsing and reading crypto news stories and 3) a filtering experience that makes it easy to find news about projects and subjects that you care about. Of course there were lowlights as well. Some of you wanted us to surface only market moving news (a feature we’re still developing). You also suggested a number of UX improvements, such as adding a unread/read feature, making price charts more functional, adding a social component, improving load speed and more. We’re taking your feedback into account as we continue to improve CoinFi News and our upcoming products, and we’re looking forward to getting your feedback on the feature releases we have coming in the near future. CoinFi News closed beta testing will continue to be a big focus for the team in September. We are committed to building a high-quality platform and only plan to release when the product is truly ready for the general public. If you’ve been helping us beta test CoinFi News, we appreciate your feedback and suggestions. If you haven’t been given access yet, stay tuned! If you’ve been following along since our ICO, you know that it’s been an up and down journey. In rushing to deliver on a very public deadline back on April 6, the public beta we released didn’t meet expectations, neither yours nor ours. Since then we’ve scaled up our data team. With a new data scientist and data engineer joining us full time this summer, the CoinFi data team now stands at four full-time team members. They’ve been working hard to build a solid data infrastructure here at CoinFi. Now, you’ll be able to explore over 6,900 coins and ICOs in the CoinFi Database with accurate data that’s updated and quality checked on a daily basis, compared to the 1,971 coins and ICOs we had previously. We scan the web across a large number of public data sources and use intelligent matching algorithms to recognize the same coin across multiple resources. On top of that, we run automated quality assessments of our data and have a moderators who are responsible for maintaining data quality. It’s what the CoinFi database should have been from the start. The current database is probably the most extensive crypto database available on the market, covering about 6,900 coins and ICOs. That number is growing everyday. The data of each coin page is more accurate and comprehensive. Let’s use 0x as an example to see the visual difference. In the short term you might not notice any major changes to the platform. But if you start searching for individual coins, you’ll see that the database is a lot more comprehensive. You’ll also see the first iteration of our Advanced Token Metrics displayed on many ERC-20 token pages. You can check the new 0x page and see the new metrics in action for yourself. If you spot any data issues, just hit the Report a Bug button at the bottom right hand corner of every page. This is just one more step in the right direction for CoinFi. 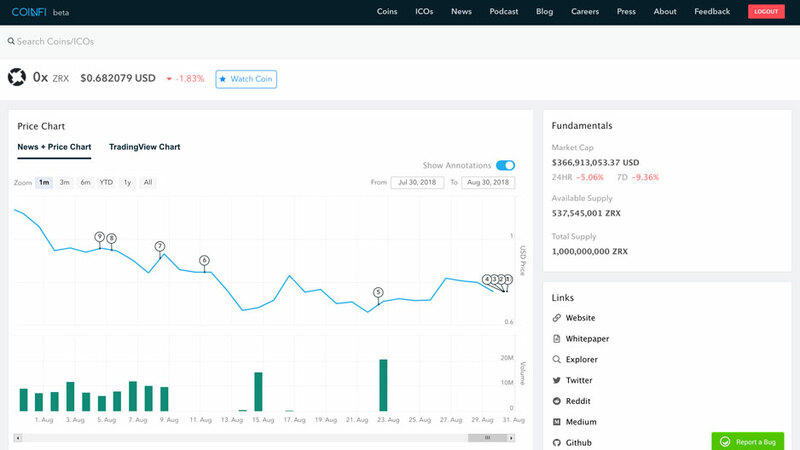 The product team is working to turn our data into actionable metrics and signals that CoinFi users can use to uncover profitable trading opportunities. In August, CoinFi CEO Timothy Tam shared his thoughts on recent market movements with Bloomberg twice in a short span of two weeks. 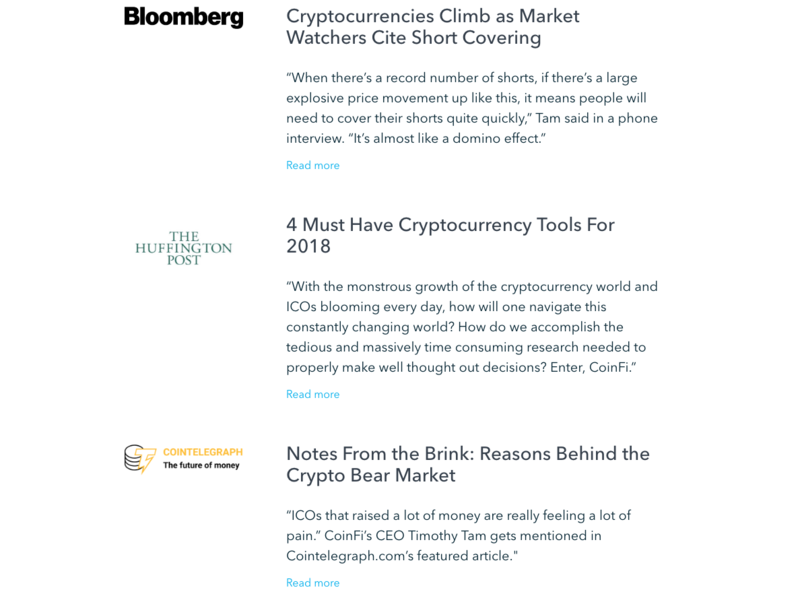 The up and coming crypto publication ThirtyK also did an in-depth profile on Tim and CoinFi. We’ll continue to push for more exposure for CoinFi as we roll out new product features. For more information, check out our press page. In addition, our CTO Han Chang will step out from behind the computer to speak at ETHIS, Ethereum Industry Summit in Hong Kong, along with other blockchain technologists like Vitalik Buterin, Loi Luu, etc. We’re excited about these upcoming events. If you’re around don’t be shy, come by and say hi! At the beginning of August, COFI token was officially listed on Kyber Network, the decentralized liquidity network which allows for the seamless exchange of a variety of tokens across multiple platforms. Kyber Network is not just another exchange, its a token payment platform that solves a key problem for the token ecosystem. Kyber allows vendors to accept e-commerce payments in a variety of different tokens but be paid out in a specific token of their choice, a breakthrough in token payment technology that CoinFi will be implementing in our token staking utility. We’ve covered more details about the listing in our press release here. Last month, we started a monthly AMA on Reddit to answer some of the questions from our community. You can find the questions and answers of the August AMA here. The September AMA now is live on Reddit and we’ll respond to the top 10 community chosen questions (by upvotes) by September 8, 2018 HKT. So fire away with your questions. 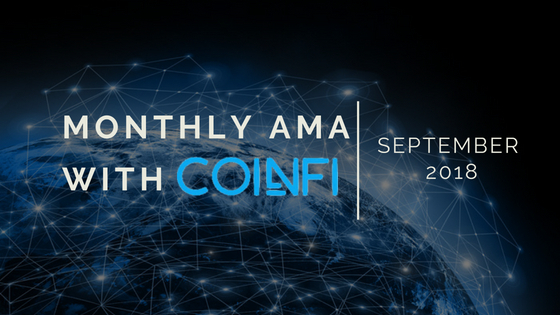 If you have a question you’d like to ask the CoinFi core team, just post it in the comment area. You can ask multiple questions. Just separate each question in a different comment. After a week, the top 10 questions that get the most upvotes from the community will be answered. In our user interviews, you indicated that the things you want to see most out of projects you are invested in is adherence to roadmap, real world adoption, real partnerships that offer business value, and listing on big exchanges. We hear you loud and clear. Our only objective as a team right now is to build a product that serves crypto investors like you. Now more than ever there is need for a platform like CoinFi, and that’s what we heard from you consistently during our user interviews. As we approach the end of Q3, we look forward to delivering features that leverage our data to help you uncover actionable trading opportunities, even in a bear market.